A tank is an armored, tracked military vehicle designed to engage enemy troops, vehicles and fortifications with direct fire. They were first developed during World War I by the British. They were a direct result of the advances in motorized transport. The tank's original purpose was to break the trench warfare stalemate that had bogged down the Western Front of the war. Armored cars had already seen limited use, but their poor combat performance persuaded Major Ernest Swinton to develop a tracked fighting vehicle. Due to the regards for secrecy, the teams working on the project were initially told they were designing and building a vehicle to carry water through desert terrain, hence it being referred to as, "that tank thing." The first tank produced by this committee was nicknamed Little Willie. It was tested by the British military in 1915 and was called a landship. The Little Willy design was followed up by the Mark I, which was actually produced in two variants. The "Male" version carried two 6-pounder light artillery guns in its side sponsons while the "Female" version swapped those for four light machine-guns. The French also developed a tank that was based off a Holt caterpillar and first fielded it in 1917. When the United States entered the war in late 1917, the US Army was initially unsure of how to use the new weapons, but eventually settled on using them as a replacement for horse-mounted cavalry. Based on that decision, the US Army opted to use the French tank design through the end of the war. Tanks immediately made trench warfare obsolete and would later come to dominate land warfare through most of the 20th century. The years following World War I saw tank development stagnate, with most interest having faded with the memories of the war. However, this was short lived as the 1930s saw a resurgence in weapons R&D Every major country knew that the tank designs of WWI were woefully obsolete and began developing new tanks to meet the challenges of new warfare. Nazi Germany took the lead in the 1930s and developed a series of progressively better tanks. The earliest of these designs were proven woefully inadequate for the battlefield in terms of firepower, protection and mobility. Functionally, the early models of the Panzer I (intended only as a training vehicle, but used in the Poland and France campaigns due to a shortage of operational tanks) were little better than the French tanks of WWI. The Wehrmacht High Command learned hard lessons that quickly led to substantial design improvements. The German military leadership developed a new kind of warfare that was perfectly suited to the strengths of the tank. German Blitzkrieg tactics were the first employment of Combined Arms strategy, exploiting the strengths of artillery, infantry, close air support and tanks carefully coordinated together proved devastatingly effective against every standing army and enabled the rapid conquest of France and the Low Countries in May–June 1940 and in 1941 helped Nazi Germany push all the way to the edge of Moscow. Ironically, the Wehrmacht employed a military philosophy originally devised by a British tactician, Major Basil Liddell-Hart, but ignored by the British War Office. Tank warfare continued to be a crucial part of the conflict in North Africa, and on the eastern front, culminating with the Battle of Kursk in July 1943. Military designs continued to improve through the early years of the Cold War. The first MBTs to be described as such were developed in the early 1950s and were in widespread service by the early 1960s. The basic idea was that a tank with adequate protection, firepower and mobility could fulfil the roles of both infantry support and tank combat at once. The first generation of MBTs are generally regarded to be the British Centurion, the Soviet T-54 and the German Leopard I. The US Army's M47 Patton (a development of the M26 Pershing heavy infantry tank) was the first American tank designated as an MBT, and served in the Army (in its upgraded M48 and M60 variants) until 1997. Many upgraded M60 tanks are still in service around the world under a diverse range of flags including Egypt, Turkey, Israel and Taiwan to name a few. However the M47/48/60 series did not have particularly good mobility and rapidly became vulnerable to enemy anti-tank systems due to their high profile and simple armour, and most NATO nations regarded them as essentially old-style infantry tanks with a reasonable anti-tank armament. The general view in the British Army (who deployed the equally slow but better armed and armoured Chieftan in the 1960s) and German Bundeswehr is that the first true US Army MBT is the excellent M1 Abrams. Modern tanks combine mobility, armor and firepower to ensure maximum survivability and lethality on the battlefield. The combination has resulted in one of the most effective land weapon systems. Tanks remain vulnerable to airstrikes and helicopters, as well as other tanks, anti-tank missiles, heavy artillery and anti-tank mines or Improvised Explosive Devices. A modern tank typically has a crew of four, a commander, a gunner, a loader and a driver. Tanks require considerable logistical support to operate effectively. Modern tanks mount a single large caliber gun with both armor piercing (for use against other tanks) and high explosive (for use against light vehicles, infantry and buildings) ammunition as well as one or more machine guns. Tank armor is strongest and thickest on the front of the tank, with lesser protection on the sides, rear, top and underside. Armor has evolved from homogenous steel to advanced composite materials. 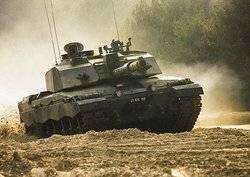 Examples of this are the British "Chobham" (Challenger 1, M-1 Abrams, Merkava) or "Dorchester" (Challenger 2) ceramic matrix armour packs, and the Russian "Sandbar" (T-72B, T-80 and T-90) fibreglass/aluminium/silicate laminate inserts. Further protection may be added outside this in the form of Explosive Reactive Armour, which uses explosive-propelled steel plates to disrupt the jet from HEAT weapons and (in the case of the Russian Kontakt-5 and Relikt systems) to destroy kinetic energy penetrators such as 120mm fin rounds. Research is underway into "active" defense systems that would destroy incoming projectiles before they could reach the tank itself. Israel's army is currently employing said systems on its Merkava tanks. The rise of effective infantry anti-tank weapons has since eroded the dominance the tank enjoyed during the middle of the 20th century. Unsupported Israeli armored units suffered heavy losses at the hands of Egyptian troops with early ATGMs in the Sinai. This experience confirmed Liddell-Hart and Guderian's insistence that tanks must be supported by infantry at all times, a doctrine that led to the German Panzergrenadier units of mechanised infantry and the Soviet development of the MBP-1, the first mechanised infantry fighting vehicle. This page was last modified on 24 June 2016, at 10:32.